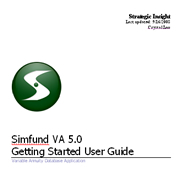 The Simfund® VA Training Supplement and User Guide can be viewed or downloaded in Acrobat PDF format by registered users. What’s New about Simfund® VA? Being able to use Simfund’s many capabilities can increase your analytical strength and help you be more productive. We have several options for you to choose from, so that your learning process can match your personal needs. We offer a Basic and an Intermediate Session.